Eighty acres was surveyed and platted as the government town of Bixby in 1902. It was a small farm community consisting of a few blacksmith shops, Coppedge’s drugstore, the City Hotel, Sapp & Sons Bank and Turner Mercantile. The town thrived in the sometimes swampy land. By 1904, tracks for the Midland Valley Railroad which originated in Midland, Arkansas, were laid to connect Muskogee, the largest town in northeastern Oklahoma, to Tulsa. The railroad was originally slated to unite Muskogee and Sapulpa. Although, there were two existing railroads available to Tulsa, the Katy and the Frisco, Tulsa businessmen were interested in Midland Valley. The men took up a collection of $20,000. They went to visit Midland Valley executive, Charles Haskell, and the rest is history. Charles Fox had an 80-acre allotment just northwest of the Bixby plat. In order to allow Midland Valley to come to Bixby, the restrictions on Fox’s allotment were removed. The railroad town site company purchased the land. A depot, known as Midland Additionwas built at the site. Streets at Midland Addition was purposefully not aligned with the original platted town of Bixby. This created factions that split the town in two parts. Breckenridge Street became the edge of the original town plat and the beginning of the newer plat. Main, Montgomery and Stanley streets were dead-ended at Breckenridge. As a result, Armstrong and Dawes streets became the main business streets in Bixby. Once the railroad station matter was settled, the old frame businesses in the original area (Old Town) built new buildings closer to the railroad. New businesses and houses sprang up on 25’X80′ lots in Midland Valley Addition. Midland Company built the first grain elevator in 1906. It was located just west of the depot and was another economic plus for the town. Eventually, four grain elevators and two cotton gins flanked the railroad tracks. 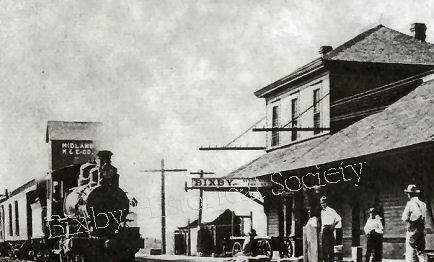 Bixby remained a small agricultural town until the Midland Valley Railroad came through. A depot at that time almost guaranteed the success of a town. It expanded transportation from foot, horse and ferry, and brought in businesses. Depot locations could be changed. They were often constructed in an established community, but sometimes the station was built, then the community grew around it. In 1905, Midland Valley Railroad moved a depot from Wealaka to a new site approximately five miles away and named it Elder to honor general manager of Midland Valley. A post office was established in the J. S. Durossett general store. Two general stores, a cotton gin and a sawmill were built in that location. The area became a center for extensive potato farming and large lumber production. Several sawmills worked in the area, including Menno Weaver Sawmill, which was eventually moved to Bixby. One Elder shipment was reported to be two million board feet shipped to a pencil factory. Wealaka suffered an economic blow in November, 1906 when a cotton gin burned. Elder, too, faded fast when the depot was moved to a new location. Midland Valley Railroad moved the Elder depot and a section house to the Mary Tiger allotment, two miles west of Elder, nearer another town site being promoted by E. E. Reynolds in 1907. First called New Elder, because so many people and businesses moved with Midland Valley, the settlement was later renamed Leonard, after a Tulsa banker. The Leonard town site, later platted for 800 lots, was almost midway between Wealaka and Elder. The Leonard area became so busy that a second station was built nearby for oil equipment. The name of this station was Altantis, named so for the Atlantic Richfield Company. Prairie Oil and Gas was one of it’s largest producers. Midland Valley Railroad ran four trains, serving passengers and businesses, through Leonard and Bixby everyday. The railroad was vital to cotton gins, grain elevators, pecan growers, produce shippers and individual farmers. It created a way to ship oil, cotton, cattle, horses, pecans and produce to outside markets. In the spring the train took cattle from the south to markets in the north. Because cows can be in transit for only a limited time, they were unloaded and penned near the railroad in Leonard and Bixby. There they were watered, fed and rested before continuing the trip. The Midland Valley Railroad remained a force in the area until automobiles and trucking developed. It stopped carrying passengers in 1934. Freight stopped in 1986 after a flood washed away a bridge near Leonard. The story is told that once when feuding with railroad officials over a depot site, W.L. Gilcrease spied a railroad official on an inspection tour in an open work cart. Coming through tall grass, Gilcrease drew his team parallel to the tracks and threw a very dead, decayed muskrat at the bugwug. Another time, when Gilcrease was justice of peace in Wealaka, Bill Childers came to court to be paid for a cow killed by a train. The court sent a bill to Midland Valley, but officials ignored it. The next time the train stopped at Wealaka, Gilcrease asked marshals to use log chains to chain a railroad car to the rails. The entire train was stuck. In those years, every train had a postal car where mail was sorted between stations. Gilcrease was holding up federal mail. He released it, however, after ordered to do so by federal marshal.